Not to be overly pessimistic, but when Wall Street starts setting records it’s time to start hatching an Investment Plan B. Stocks can continue to rise, but they can also either stagnate for a very long time, or they could start turning down. When ever markets hit new records, you should be preparing your investment portfolio for volatile markets. It’s not that volatility is automatic with new highs, but rather that it becomes more likely when we’re in uncharted waters the way we are now. What are some ways that you can begin preparing your investment portfolio for greater volatility? When markets undergo multiyear rallies, it’s easy to become hypnotized by steady, annual investment gains. It’s usually when we approach market tops that most investors are most heavily invested in stocks. For example, it’s not at all uncommon to see investors with 80%, 90%, or even 100% of their portfolios invested in stocks as new records are achieved. While this allocation can work like magic when the market is rising, it can be a strategy for a crash-and-burn if the market suddenly turns down. Now would be a good time to begin moving some money out of stocks and into safe investments, such as certificates of deposit, money market funds, and Treasury securities. The interest rate returns on these investments are poor right now, but if the markets suddenly turn volatile, safety of principal will become a priority. Any money that you do not lose now, will be more that you will have available in the event of a market downturn to buy stocks at lower prices. Just be careful not to invest in any interest-bearing securities that have maturities greater than five years. If market volatility is being caused by rising interest rates, then you could be at risk of principal loss even on interest-bearing securities. For example, a 10-year Treasury security paying a 2% rate of interest, could experience a drop in principal value if rates were to rise to 3%. Where stocks are concerned, stocks that pay dividends — especially if they are above average — can be at least a semi-safe harbor in a volatile market. The fact that the stocks pay dividends will help stabilize the prices in the face of declining markets. Some choices here maybe preferred stocks, utility stocks, or any blue-chip stock is paying dividends at a rate that is at least comparable to the yield on five- or ten-year Treasury securities. The advantage of these stocks is that you will be earning a solid income, while still participating in market advances. You’ll just be doing so with less upside potential, but also with less risk. Volatile markets are an excellent time to buy value stocks. Volatility forces investors — especially the institutions and major players — to become more selective with their investment choices. Since rising markets tend to concentrate in a relatively small number of overachieving stocks, there are many issues that get left behind in the price surge. This can lead to a large number of undervalued stocks that represent excellent investment options in a volatile market. The stocks have excellent fundamentals, often better than those of the market leaders, but may have been overlooked simply because they’re not the market leaders. In this way, value stocks can represent a bargain even if the market is at record levels. You can look for individual stocks that are undervalued, or you can choose to invest in value funds instead. The funds may be the better choice, if only because market volatility can make it more difficult to identify individual stocks. When the financial markets become more volatile, many investors choose to exit the market. While this can be seen as the safe choice, it can also leave a lot of money on the table. 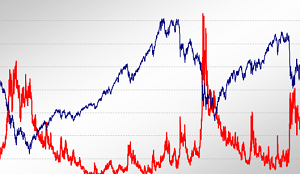 Volatility does not necessarily mean that stocks will decline – only that they will move in less predictable patterns than they have in the recent past. The markets may move sideways, then drop, and then rise again. In that kind of investment environment, it can be very profitable to buy on market dips. No matter how unsettled markets may become, there will always be money in stocks, and it will always chase certain stocks somewhere. At any given point in time, and in any kind of market environment, there will always be market leaders. The names of those companies may change, but there will always be a few out there that will be chased by the big money. If you can identify a few of them, you may see your portfolio continue to rise despite increased market volatility. You probably won’t maintain anywhere near the exposure in stocks as you did with the general stock market during the run-up, but the profits to be made in the speculations of the day can still be substantial. How do you plan to invest your portfolio should the markets suddenly become more volatile?